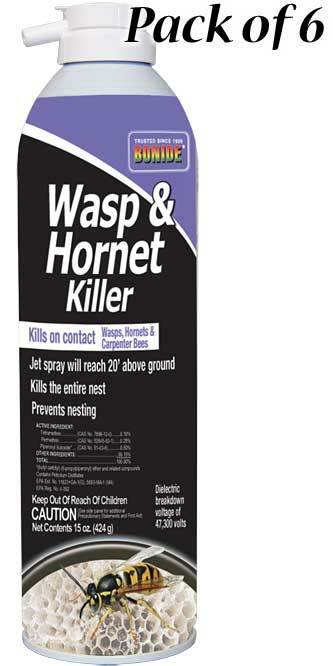 Control wasps and hornets from a safe distance with this Bonide Wasp, Carpenter Bee, and Hornet Killer Spray. This jet spray will reach nests up to 20' above ground and will kill wasps, hornets and other flying insects on contact. Simply spray under eaves, around screens, window frames, doors, patios, cracks, holes, and crevices where wasps, hornets, yellow jackets, carpenter bees and mud daubers are noticed. For best results, spray in early morning or late evening when insect activity is minimal. Stand from a safe distance and spray until the nest is thoroughly saturated, to kill the entire population. Residual action of this spray will eradicate wasps and hornets returning to the nest. Keep your home free of stinging insects with this Wasp, Carpenter Bee, and Hornet Killer Spray. Note: This case pack includes 6 bottles of Bonide Wasp, Carpenter Bee, and Hornet Killer Spray.